In 1961, Minnesota joined the ranks of Major League Baseball and the National Football League. It might be hard to believe today, but before that there were no Twins and Vikings in the state history, unless you buy the story of the Rune Stone in Alexandria and those Vikings might have tossed rocks, but not footballs. There has never been another year like this in Minnesota sports history and happily I can say I was there – both as a high school sophomore at Central High School in Minneapolis and as an usher in Met Stadium. I loved the Met, the big erector set in the distant community of Bloomington. This was the big leagues for both football and baseball (shortly after we added the soccer team – the Kicks) and it was in this rural suburb that we planted the seeds for this part of our community lore. Of course, they were not called the Bloomington Twins or the Bloomington Vikings. It might have been appropriate, but then Wold Chamberlain – our massive international airport (just joking) was also located nearby and no one thought to call it the Bloomington airport. Of course, we had a sports history before this. In 1960, the Minnesota Gophers were named the No. 1 college football team in the country – yup, Alabama did not get that one. Playing under Murray Warmath with players like Sandy Stevens at QB (he then played in Canadian Football League), we were at the top of big time college football. Then we went to the big game – the Rose Bowl, where we set the precedent for the soon to arrive Minnesota Vikings – but lost the biggest game of the year to Washington 17-7. In the year of the Vikings and Twins, the Gophers ranked sixth in the nation and corrected their previous loss by winning the Rose Bowl against UCLA 21-3. We were excited about our sports legacy and we still had a professional team, the Minneapolis Lakers, in 1960. But Mikan retired – he was so good they changed the court, enlarging the lane so that he would not get every rebound. And we were champions – five times in six years with a roster of NBA Hall of Famers. In the 1958/59 season we drafted Elgin Baylor and the future looked bright. Sitting in the Minneapolis Armory where many games were played, there were no bad seats. Unlike the Timberwolves stadium where you need binoculars in the upper deck to watch seven-foot players, at the Armory the players towered over us and it was almost like being on the court. It was great, but attendance was not – how many can you get in the Armory? So in 1960, just as we were getting excited about our new teams, the Lakers were moved – to the West Coast, to Los Angeles, to a city that does not even know what a lake is! We would have been depressed, but the Twins were coming. There were minor league teams still playing – the Minneapolis Millers were in Nicollet Stadium, just six blocks from where I lived, until 1956 when they moved to Metropolitan Stadium (who came up with that name for a stadium in the middle of a field in Bloomington?) where they played until 1960. In St Paul, the Saints were the farm team of the Dodgers, who were about to move to the West Coast. Who knew then that the Giants would be enticed to move with them? But 1960 would be the last year of this franchise until Mike Veeck and others created the new Saints in independent ball who would play at the same stadium – Midway – that the original Saints used in their final season. In 1958, future Twins manager Gene Mauch was the skipper of the Millers – now a farm team for the Red Sox, having been associated with the Giants for years. Mauch led us to the championship and then we lost the Minor League World Series. We knew that major league baseball was coming, and Horace Stoneham of the Giants played us for country bumpkins, promising to move here and using the leverage to get to San Francisco. Our final year was pretty glorious – Carl Yastrzemski was here, as was future Twin Al Worthington. This left an opening for a team which we had no association with – the Washington Senators, and their owner/GM – Calvin Griffith. But who cared? This team, so famous for the saying: "Washington DC, first in war, first in peace, last in the American League," was coming. Time to learn who they were. From Senators to Twins – what a transition. Some bonus player named Harmon Killebrew showed up and so did some Latin players like Camilo Pascual and Pedro Ramos. The Pirates were the reigning champions – they were FAMILY – we were in baseball heaven. In the meantime, something else was brewing – the NFL was going to put a team in the state the same year and the same stadium. It was Viking time. And we would be playing outside like real Vikings. Norm Van Brocklin would be our coach, we would have a rookie QB named Frank Tarkington and no one expected him to do anything. As an expansion team, we were expected to be the tackling dummies for the rest of the league. The champions were from Philadelphia – a team called the Eagles, but we knew we would get even with them someday (we hope). 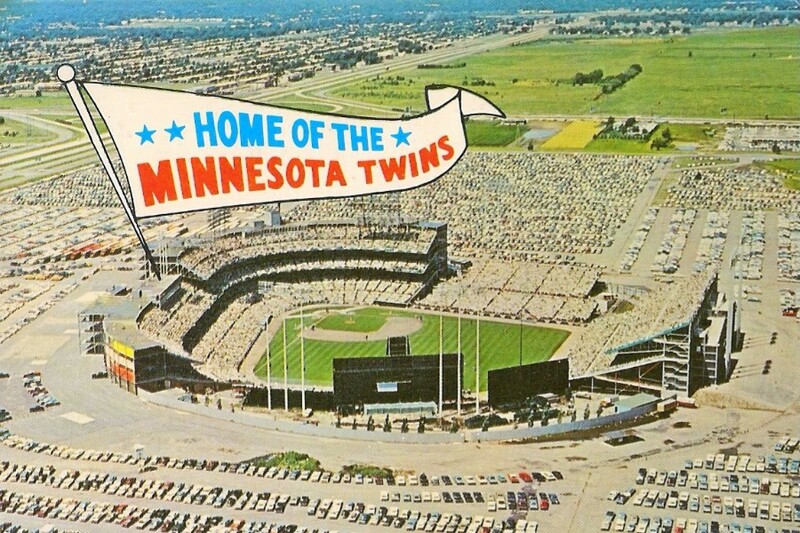 April 11, 1961 the Twins played the very first major league game in Minnesota. There were 39,615 fans, a sellout, and I was an usher. We were so new to this that we still did not know who those players were, but they were ours, so we cheered. Metropolitan stadium with its three decks had never felt the feet of so many people and when they got their coordination together, they would stomp their feet and rock, or should I say – sway, the stadium. Unaccustomed to the rules of the major leagues I remember being booed by thousands of people when I would go to make sure someone was not hurt by a foul ball. They were sure I was there to take the ball back! We loved the fresh air, the breeze coming in from right field, the uniforms and excitement of the game, even if we had no idea who manager Cookie Lavagetto was. We had Billy Martin, a future manager at 2B, Harmon Killebrew, a future HOF player, at 1B, Zoilo Versalles at SS and Bob Allison in the OF. With Pascual and Ramos were Jack Kralick and Jim Kaat in the rotation. This was so heady we hardly noticed that one of our own – Roger Maris – was hitting the baseball out of the park more than anyone in history. Actually, we knew but it was not as important as the fact that we won 61 games! Of course, we also lost 100, but who cared? This was the majors and our guy Harmon hit 46 home runs. When the season was over, the Twins had drawn 1,256,723 fans, the third highest total in MLB and we were in seventh place, not last (10th). Now it was Viking time! The Senators were an established team that moved, but the Vikings were an expansion team and they were not supposed to win. After opening with an exhibition in Sioux Falls, SD the team came home to a rousing welcome. Like good Minnesotans, the fans were all on time, the parking lot was full and the ushers helped people find their seats quickly. It was an excited crowd, but everyone knew we would lose, that is, everyone but Fran Tarkington who had not read that script. He came off the bench to replace the wily old vet, George Shaw, and beat the mighty bears 37-13 on opening day! For a week we had a perfect record in the NFL. True, we had the Minneapolis Marines and Duluth had the Eskimos, but that ancient history hardly makes a dent in our professional football story. Even if the Eskimos had Ernie Nevers, the first superstar. We got a franchise in the American Football League, but never played a game. The fact that we got awarded this new team meant the NFL (which was not merged with the upstarts) decided to put a team in Minnesota if we gave up that first AFL franchise, which subsequently became the Oakland Raiders. The new owners included Ole Haugsrud, who had given up the original Duluth team to the league with a provision that he would be allowed ownership in any future NFL team. It took forty years. Playing outside, the Viking fans became the new version of the Packers – standing in the cold, breath frozen in the air, a unique sound of clapping gloves and a rabid excitement that would continue right up today’s softer indoor fans. The opening win shocked everyone, and the roar was similar to the playoff games of the future, but the shock wore off with seven straight losses and a final 3-11 record. Being in the stadium at the end of the season, no one minded that we were packed in tightly. It just made us warmer. Thermos’ went from coffee to slightly stronger beverages and the sounds of the stadium faithful echoed across the frozen prairies of Bloomington. An average of 34,586 people attended the games, many of them lopsided contests. Norm Van Brocklin, the ex-quarterback of the Philadelphia Eagles, was the grumpy head coach because the quiet man of the north – Bud Grant – would not cancel his contract with the Blue Bombers in the Canadian Football League. Eventually we would get him. I only ushered for one year, but that was enough to create a love for sports that continues today. Only baseball remains with as much passion, but that dates back to my childhood when the only vacation my parents would take was a trip to County Stadium in Milwaukee to watch the Milwaukee Braves in their championship seasons. My career would take me in many directions, including one-year writing for the short-lived Midwest Spectator, a Twin Cities sports publication, and finally into my career in the Outdoor/Environmental Education. Like many people, I was moved by the events that I witnessed when I was young. Even though I attended all the 1991 World Series games at home, nothing will be as lasting as that first night when the sun was setting, and the stadium lights came on, when the green of the stadium grass seemed to turn luminescent and the players uniforms sparkled in the light. There was the smell of the concessions, the sound of the bat and the collective anticipation that something good was going to happen – something good that would continue for the next 57 years and who knows how long into the future. Not sure sports have gotten better since then, but, at least we have the memories. Walk down memory lane. I wasn't as aware of the Vikings right away as the Twins. WCCO assured that. My moms sister and their family lived not far from the Met. South and a little west I believe. They lived on a street with houses on one side and corn fields on the other. Probably within a mile of the Met. Harmon and Camillo were my first pro sports heroes. Anyway, thanks for the memories of a simpler time. Better? Who knows. But dertainly different. I wanted my big brother to like baseball as much as I did, so I gave him Harmon Killebrew and took Bob Allison. But then Zoilo alienated my affections for Allison in 1965, which was my favorite season memory until 1987. I remain open to switching allegiances. My big brother was a disappointment as a baseball fan. Still is. Well written nostalgia piece. Brought back a lot of memories. Like the author, I remember the sounds and smells of attending a double-header at Met Stadium, my first professional baseball game. Four kids and three adults piled into one car for the 2 hour drive to the stadium. Got a bag of popcorn and an orange pop. Can still remember both the taste and the smell. Didn't break the old man to pick up the tab either. Bob Allison smacked a home run into our left field bleachers, touching off a stampede. Attended a Viking exhibition game that fall as a member (freshman) of our high school football team. Somehow the team got free nosebleed tickets, but we had to wear our team jerseys. I think the Vikes were that desperate to fill up the stadium for exhibition games. Drum up some fans. I had an uncle that played for the Packers in the 40's, so I'd been a Packer fan up till then. I arrived a Packer fan, left a Viking fan. Baptismal event. Been going through hell ever since. Baseball is still my game though. Twins are more like purgatory than hell; hope versus hopeless. Great stuff.I loved the Met.I remember driving up to it, monolith like on the undeveloped land, surrounded by great big parking lots, walking in up those ramp-like structures to the cheap seats.Such Wonderful memories. That 1960 Olympic hockey team had some great Minnesotans on it.Don't forget Tommy Williams from Duluth. There was an adult curmudgeon in our very small town who constantly dissed Harmon. And he ragged me because he knew I was a big fan. The middle of one season we bet a pop (it was years before I found out some people call it soda) on whether The Killer would hit 50 HR's that year. Needless to say that was his 49 year. Probably a good thing, it maybe was the impetus for my dislike of all things gambling? I was born in WI, given the Packers as a birthright, loved them - we were starting and they were the best. I rooted for the Vikings and drove my dad nuts, but even today, I am still a Vikings/Packer fan.Of course I started as a Braves fan, but never got caught up with the Brewers.When Atlanta stole the Braves the Twins became my only team and when they beat the Atlanta Braves in 1991 I was ecstatic.I have never had a happier walk than I did leaving the Humphrey! Remember how those circular ramps vibrated and jiggled under the feet of hundreds of fans leaving after the game? Scared the crap out of this country bumpkin the first few times I felt it. I sure do.We had some big crowds and those ramps were almost disasters.At an angle that really moved people around - a fall and there was a pile up.But the thing that stood out to me was how the big erector set vibrated when the crowd started to stamp their feet in unison.I was nervous working third deck as a usher. Thanks for sharing all these memories. I'm disappointed that the Met Club is going away at Target Field. I appreciated the fact that there was a place inside the stadium that acknowledged that time in Twins history. The grass was always greener at the Met than any where else for some reason.